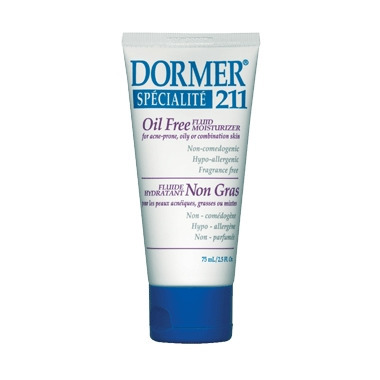 Dormer 211 Oil Free Fluid Moisturizer is specially formulated for daily use on acne-prone, oily or combination skin. An oil-free and fragrance-free balanced moisturizer that is rapidly absorbed for a matte finish. Excellent base for makeup. Tones, softens and promotes skin elasticity. Dermatologist recommended. Apply to face and neck area after normal skin cleansing,or as directed by your physician. For external use only. Aqua, Stearic Acid,Sorbitan Stearate, Cetyl Alcohol,Polysorbate 60, Allantoin,Soluble Collagen, Methylparaben,Propylparaben, Citric Acid. Great moisturizer if you have acne prone skin. It's lightweight yet moisturizing enough. Sinks right in and leaves a nice semi matte finish. Also, the customer service was great and received my order very quickly. This is the best moisturizing product I have ever used. After the local drug mart stopped selling it, I wasted a lot of money trying other recommended brands. I am so glad I came across it again at Well.ca. Great product! I have very oily skin and when I use it my face is moisturized with a matte finish. This moisturizer has been a life saver. The water base has helped calm my skin down and I can even use it around my eyes. I do agree that the packaging could be changed so it doesn't run out as easily. Overall, I would definitely recommend this to anyone with sensitive skin. Product seems to work fine but the package design is horrible. Moisturizer leaks into the cap, and the hinge on the cap is so tight that it flies open and flings moisturizer on the wall (or on your clothes). This happens every time even though I actively try to stop it. Maybe I'm just dumb, but for such an expensive product I expect a bit more thought to go into the package design. Won't be buying this again. It works well, isn't greasy but does nothing to help heal your acne if that is what you suffer from. I like Clean and Clear dual action moisturizer a lot better. This is kind of pricey for nothing more than moisturized skin, I need help with acne as well. I love this product! I have very sensitive skin and this is the only moisturizer that doesn't make me break out. It's light and yet moisturizing. Hands down, the best moisturizer I've ever tried. I agree that this moisturizer is fantastic. If you need hydration then this hydrates both oily and dry skin wonderfully without leading to pore blockage. It's great for skin cells lacking water content, with a matte finish. This is my absolute favorite water based moisturizer but it's hard to find. I'm very glad well.ca carries it. I live in Alberta and even though I have oily skin, this is not quite moisturizing enough for me in the morning after washing my face. It has not made my sensitive skin break out, however. The texture is quite watery. It has a nice matte finish, so it makes my skin look a lot smoother (meaning it minimizes my dinner plate sized pores). I like how it's easy to spread, and although I apply it very liberally, it never looks greasy. My overly sensitive skin didn't mind this moisturizer at all, where as normally it might have broken out by now. One thing I didn't like so much about this moisturizer is that it could have better packaging. I don't believe it's viscous enough to come out of a squeeze bottle...it would benefit from a pump bottle. Nice, simple oil-free moisturizer. It is absorbed quickly, doesn't leave a greasy film, and my sensitive combination skin does look and feel a lot nicer after using this every morning for two months. It could probably be a little more moisturizing but overall I like this a lot.